This coconut flour pizza crust is the best gluten-free pizza crust I’ve ever tried. It’s soft and tasty, and sturdy enough to hold with your hands! OMG OMG OMG! 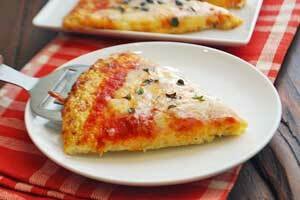 You have to make this coconut flour pizza crust! It is now my favorite low carb, gluten-free pizza crust. It’s very easy to make, and it’s unbelievably good. I’ve been making cauliflower pizza crust regularly for a couple of years now, and we’ve been very pleased with it taste-wise. But texture-wise, it’s just a bit too flimsy. So I tried a few other low carb pizza crusts. Almond flour pizza crust was good but a bit too crunchy, and definitely too calorie-dense. Shirataki pizza crust is pretty good, but I’m no longer a fan of shirataki noodles, as I’ve learned they can cause serious gut distress in some people. But doesn’t coconut flour crust taste sweet? I’ve been wondering about coconut flour pizza crust for a while now. But I assumed it wouldn’t work since coconut flour is quite sweet. However, this recipe from Sarah, The Healthy Home Economist, convinced me to give it a go. And I am so glad that I did! 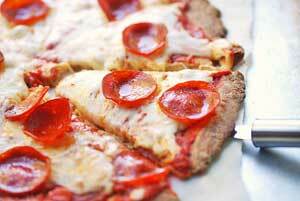 This coconut flour pizza crust is the best gluten-free pizza crust I’ve ever tried. It’s soft, but not too soft, so you can easily hold it with your hands. But the best part: it’s delicious! Sarah is correct – the seasonings do mask the inherent sweetness of the coconut. So the result is a pleasantly savory crust that goes wonderfully with the toppings. And while it’s a bit more calorie-dense than cauliflower pizza crust, the better texture is worth it. A nice variation on this basic recipe that I like to make for brunch is this very tasty low carb breakfast pizza. Yes! Coconut flour is a good keto and low carb choice. Coconuts are quite healthy. As for coconut flour, 2 tablespoons have 9g carbs, but 5g of them are fiber. This small serving also has 300 mg of potassium and 3 g of protein. Line two pizza pans with parchment paper and spray the paper with olive oil. You can also make these pizzas side by side on a single, large baking sheet. Measure out the coconut flour, breaking up any lumps with your hands. Stir the coconut flour into the egg mixture, mixing until smooth. Using a rubber spatula, transfer half of the mixture onto each of the prepared pans. Use a spatula to spread it out evenly into an 8-inch circle. Bake the pizzas until set and the edges are beginning to brown, about 15 minutes. The crust will still be light at this point, and that's OK. Spread each pizza with half the pizza sauce, sprinkle with half the shredded mozzarella, and add any other toppings you like (I used Applegate’s pepperoni). Broil each pizza until cheese is melted and crust is golden-brown, 2-3 minutes.